Just re-published the book with the new cover/name/description on Amazon. There are two fields in the book details page – “Book Name” and “Subtitle”. Originally, I only had “Artifice: Episode One” in the “Book Name” field, and “Subtitle was blank. Now, I punched in “Strange New World” in the “Book Name” field, and “Artifice: Episode One” in the “Subtitle” field, thinking that all would be okay. I’ll change the “Book Title” to “Strange New World (Artifice: Episode One)” tomorrow sometime, and leave “Subtitle” blank. So, if you’re ever in a spot where you need to do this in the future with one of your books, learn from my lesson. New Episode One Cover Art [Soon]! I promised it, and I’m about to deliver (in about a week or so). I just submitted a design contest for Artifice: Episode One on 99Designs. We’ll see what magic happens. Also, if anyone was bored enough to read the brief for the design contest, you’ll also know that Episode One will now have a title of “Strange New World”. I’ll admit that it’s not the most creative or non-cliche title. In any case, it can always be changed if I think of something else during the week. For those who are curious, Episode Two’s title is still in the air, but I’ve more or less decided on “Oncoming Storm” for Episode Three. 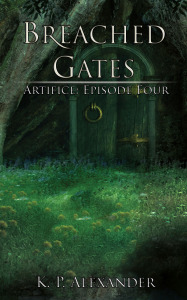 Episode Four will be titled “Breached Gates”. I’ve recently got quite a lot of feedback regarding Episode Two. While they were generally positive, one recurring theme seemed to be that readers were sometimes getting lost in a sea of characters and subplots. Now, because I will be selling Episode Three, I’d rather it be worthy of the [small] price tag that’ll be attached to it. To that end, I’m going to be doing some rework on Episode Three, which will push the release date to around mid-October at the earliest. However, there is some good news! There will be a special “Halloween Episode” short story released in mid-October. This was actually an entry that was written for a contest, which ended up evolving into what was basically a “Simpson’s Halloween Episode” for Artifice – basically, the story contains the same characters, but it’s totally non-canon – i.e. Homer isn’t actually a vampire in the next “normal” episode. This Halloween Episode will be released for free. Also, just got around to watching the final three episodes of Burn Notice on the PVR. Not a happy camper. More on this later this week. Bedtime now. First off, I do need to apologize for the sparse updates. I’ll try to make more time to keep you guys in the loop (especially regarding Artifice: Episode Two). Which leads into the next point. Another apology is in order, as Episode Two won’t be released this month. My editor (who is doing this for free, so go easy on her :)) is just ending her maternity leave at the end of this month, and her time right now is dedicated to dealing with that, getting ready to go back to work, and planning a first birthday party. To that end, I’m going to not bug her to read my book for another few weeks. Realistically, I don’t expect Episode Two to be available for download until close to the end of April. Again, apologies to everyone. This was just the result of bad planning/timing. Also, another bit of strange/bad news. It looks like Amazon.co.uk has reverted Episode One back into a paid book for some reason. I’m currently trying to get it to go free again. Again, I’ll try to post updates more frequently. Also, as compensation, I’ll see about posting the first few pages from the working copy of Episode Two as a teaser sample. Thank you, random anonymous person. 🙂 I’ll try to get Episode Two finished as soon as possible. Edit: Forgot to mention – Episode One is now available for free on Amazon.co.uk! Over 150 downloads so far from Smashwords, but it looks like it’s starting to taper off. Good news is that Artifice: Episode One has been shipped to Barnes & Noble, Kobo and Apple. Apple may take up to a few weeks to vet the book, depending on their backlog, but B&N and Kobo should be up in a matter of days. Once that’s done, I should be able to get the Amazon price adjusted, then I can start promoting in earnest. Artifice: Episode One has been downloaded 86 times within the last two days! Not Neil Gaiman numbers, by any means, but it’s exciting to watch that counter increase. Well… not that exciting, but you know what I mean. Also, I’ve added a Google Ads thingy further down the page at the side. It’s a blank spot right now, but the Google Adwords page says that advertisements will start within a few days.